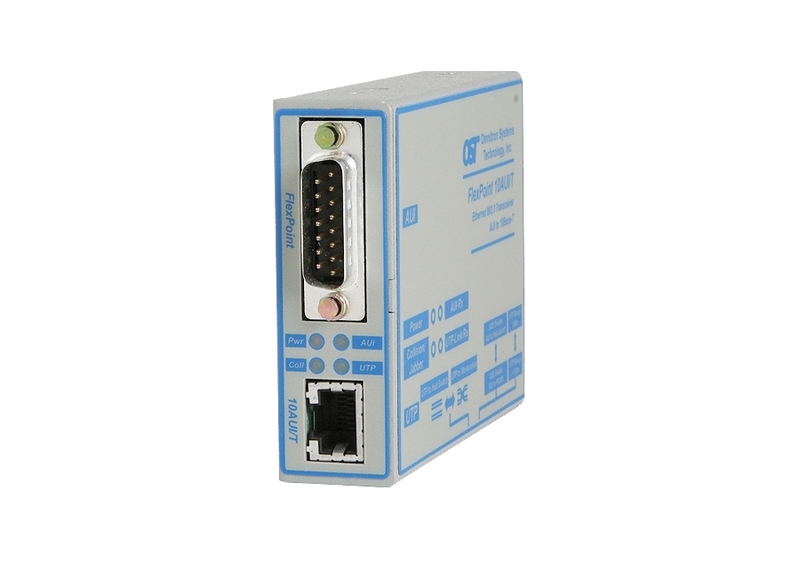 The FlexPoint 10AUI/T is a 10BASE-T to Attachment Unit Interface (AUI) converter. The transceiver provides the physical medium conversion between units equipped with the AUI and the unshielded twisted pair (UTP) connectors. The FlexPoint 10AUI/T Transceiver operates in Half-Duplex. It supports switch-enabled SQE function, also known as heartbeat. The FlexPoint 10AUI/T is a 10BASE-T to Attachment Unit Interface (AUI) converter. The transceiver provides the physical medium conversion between units equipped with the AUI and the unshielded twisted pair (UTP) connectors. The FlexPoint 10AUI/T Transceiver operates in Half-Duplex. It supports switch-enabled SQE function, also known as heartbeat. This signal tests the collision detection electronics of the transceiver, and informs the Ethernet interface that the collision detection circuits and signal paths are working correctly. Descriptions of the LED indicators are provided on the label for easy in-the-field configuration, installation and maintenance. The LEDs report the availability of power, port activity and link status, collision and jabbers. The Collision/Jabber LED provides error indications. Collisions are the result of multiple hosts trying to use an Ethernet segment at the same time while jabbers are frames that exceed the maximum frame size. A crossover switch eliminates the need for a crossover cable and facilitates connectivity to network equipment such as hubs, switches and workstations. FlexPoint modules can be mounted utilizing optional wall-mounting hardware or with DIN-rail mounting brackets. They can also be rack-mounted in a 5-Module shelf or in a high-density 14-Module, power-redundant Powered Chassis. FlexPoint modules installed in the 5-Module shelf or used as standalone devices can be powered by an external AC to DC power adapter, or through the 5VDC chassis connector. Standalone modules can also be powered by attaching an external DC power supply (18-60VDC) or from the AUI connector. When used in the 14-Module power-redundant Powered Chassis with any combination of AC and DC power supplies, the installed modules are powered via the 5VDC chassis connector. The wide variety of FlexPoint mounting and power options provide flexible upgrade paths as network requirements change and grow. FlexPoint unmanaged media converters are easy to use and provide dependable fiber connectivity in Enterprise and Government networks around the world. For wide temperature (-40 to 60°C) add a "W" to the end of the model number.